Adding a Heat Sync to the MCPX Northbridge, effectivly doubling the life of your Xbox under normal operating conditions. 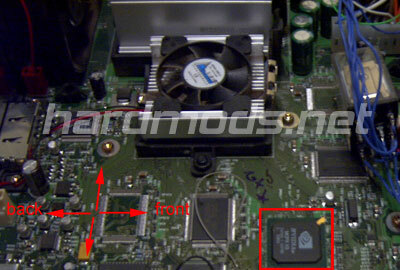 The Nividia MCPX graphics chip on the Xbox motherboard is the most common cause of Xbox failures. Typically this chip overheats, early signs of failure are frequent (random) lockups as well as choppy playback of audio and video. This tutorial covers where the chip is and how to add a heat sync to prevent failure from happening. Dissassemble your Xbox (it's really easy). Remove the cover, the hard drive tray, the DVD drive tray, and any other items around the MCPX chip on the motherboard. Clean off the chip using some compressed air. Install the new heat sync. The chip is roughly 1" squared so heat syncs that size and larger should work well. PC northbridge heatsyncs work very well for this. Our sponcer SpottedHorse sells one here, it has the adheasive on it ready to peal and stick. if using a northbridge heatsync apply the thermal paste as directed. After applying the thermal paste to the heatsync reguardless of your method you should keep moderate presssure on the heatsync against the MCPX chip for 2 minutes. This mod will not improve your xbox temps, it will however make the life of your xbox motherboard almost double by protecting it's weakest link.